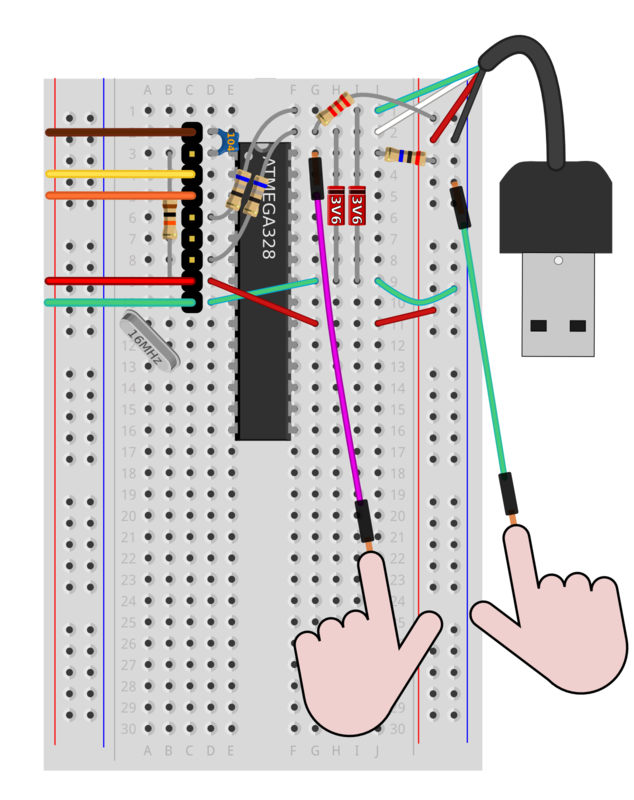 This guide provides details for learners to wire, program and configure a @ShrimpingIt conductive keyboard. 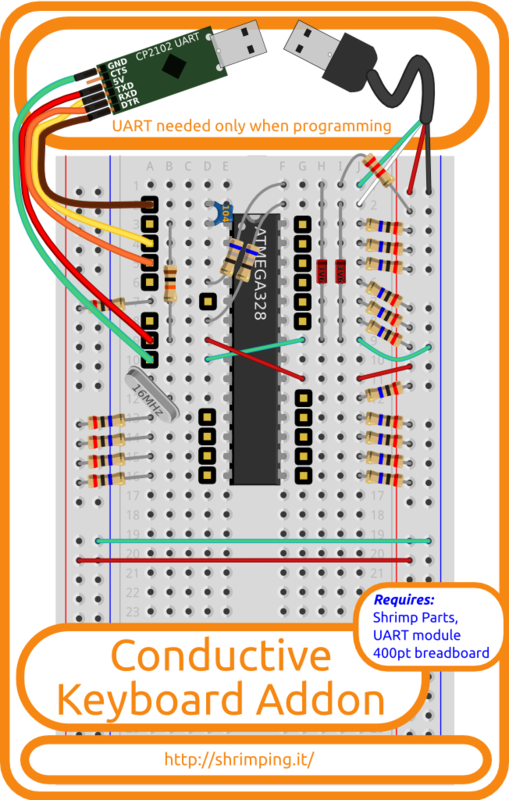 For orientation, see the Conductive Keyboard project page. Before embarking on the Conductive Keyboard, you should have successfully completed the Blink build. This build uses the Blink circuit as its starting point. You can remove the Blink LED and resistor as these are not used in the circuit, and it will be easier to wire the circuit with them out of the way. The 9-pin header uses an area where we would like to add some pull-up resistors later in the build. 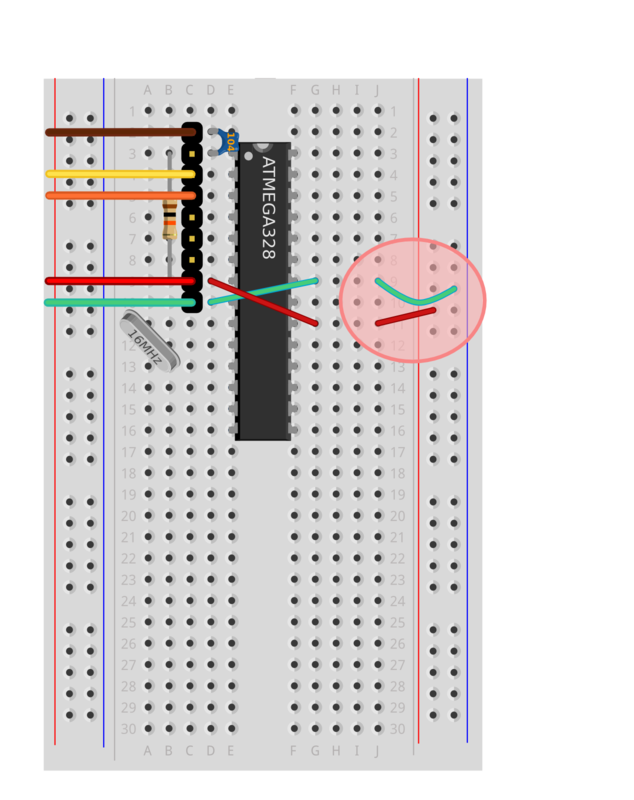 Since the five holes in each row are equivalent (they are connected together inside the breadboard), we can move the header across to give us more room, without affecting the circuit. Although the coloured UART ribbon cable is not shown, it will avoid errors and save you time later if you leave the wiring intact following your Blink testing. The power rails on the right must be connected to +5V and 0V, the same as the ATMEGA's power pins. These will be used to provide the +5V signal for the Right-hand Pull-ups which are so fundamental to the behaviour of a MakeyMakey. The right-hand power rails will also be a convenient place to connect the +5V and 0V wires when the project is running as a USB keyboard from the hacked USB cable we'll attach later. When complete, our system will emulate a USB 1.1 keyboard. A USB 1.1 cable is made up of four wires with a standard color code. 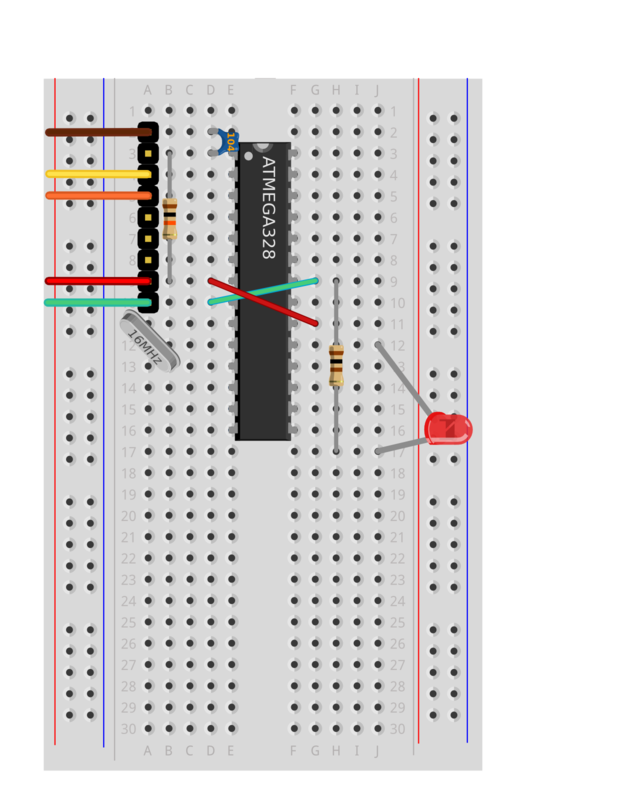 Two wires provide power +5V (Red) and 0V (Black), connected to the power rails. The other two are Data+ (or D+, Green) and Data- (or D-, White), for sending data back and forth between the host (laptop) and the peripheral device (keyboard). We'll attach these to free rows above the ATMEGA chip for later connections to be made. @ShrimpingIt bagged kits contain a Male type A plug cut from a generic USB cable, with crimped male header pins guaranteeing breadboard connectivity. However, you can use any USB cable chopped in half, soldering pins on the end, or sliding all the strands of each wire carefully into a breadboard hole before jamming in a male header pin to hold it in place and in contact. The Data+ (Green USB) and Data- (White USB) signals accept a maximum of 3.6V. We can use Zeners to guarantee this. Essentially, any voltage above 3.6V is allowed to bleed away through the Zener. Zener diodes are tiny red and black cylinders on a silver wire. A diode operates like a water valve, allowing current to flow freely in one direction, but resisting it in the other direction. However, a Zener is a special kind of diode, like a leaky water valve. Zeners normally resist current flowing backwards, but they 'break down' (make a short circuit), when the reverse pressure (voltage) applied exceeds a certain threshold. 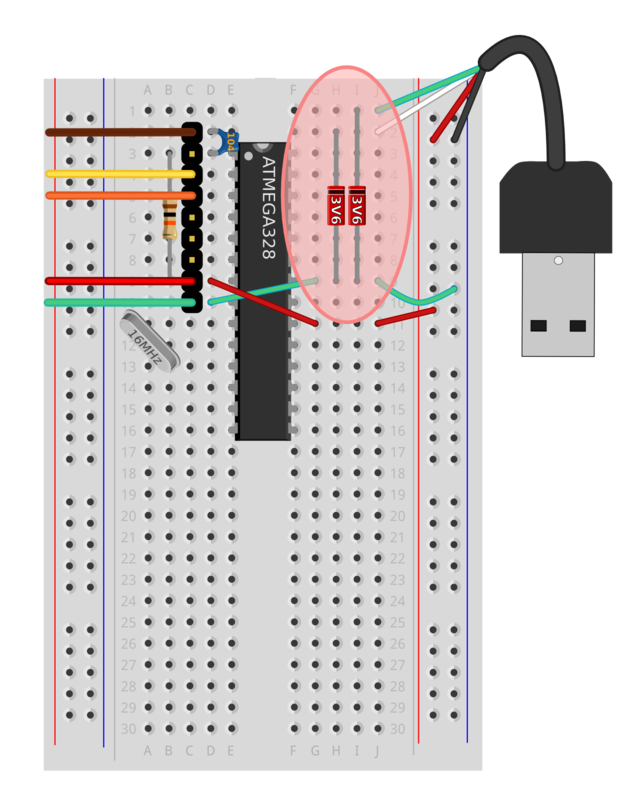 We'll generate signals in software to make the ATmega's pin 4 and pin 6 behave like D+ and D- of a USB 1.1 keyboard, but the signal from the ATmega is at 5V when it should be at 3.6V to be conformant to the standard. The Zener diodes effectively 'short-circuit' anything above 3.6V feeding it directly to ground (0V). Using 68Ohm resistors to connect to D+ and D- wires limits the flow of current allowed through this short-circuit from our signalling ATmega, and dissipates exactly 1.4V of our 5V signal as heat before it gets to the USB wires. The 2.2kOhm resistor is a pullup resistor. The presence of this resistor (and the strength of its pull) can be detected by the laptop when you connect the conductive keyboard, and it indicates that the laptop should try to connect at USB 1.1 'full speed' which is just 12.1 Mega bits-per-second. Note, on some USB hubs, this will limit ALL USB connections to be the speed of the slowest device. Each of the colored bands corresponds with a single figure number in the resistor code. Resistor codes begin at the end opposite the gold (quality) stripe. The 68Ohm resistors have Blue, Grey, Black for a code sequence 6, 8, 0. The first two figures of the resistance in Ohms are 6 and 8, and this should be followed by no extra zeroes, in other words 68() or 68Ohms. The 2.2 kOhm resistors have Red, Red, Red for a code sequence 2, 2, 2. The first two figures are 2 and 2, and this should be followed by two extra zeroes, in other words 22(00) or 2,200 Ohms. There are 1000 Ohms in a kiloOhm so that's the same as 2.2 kOhms. 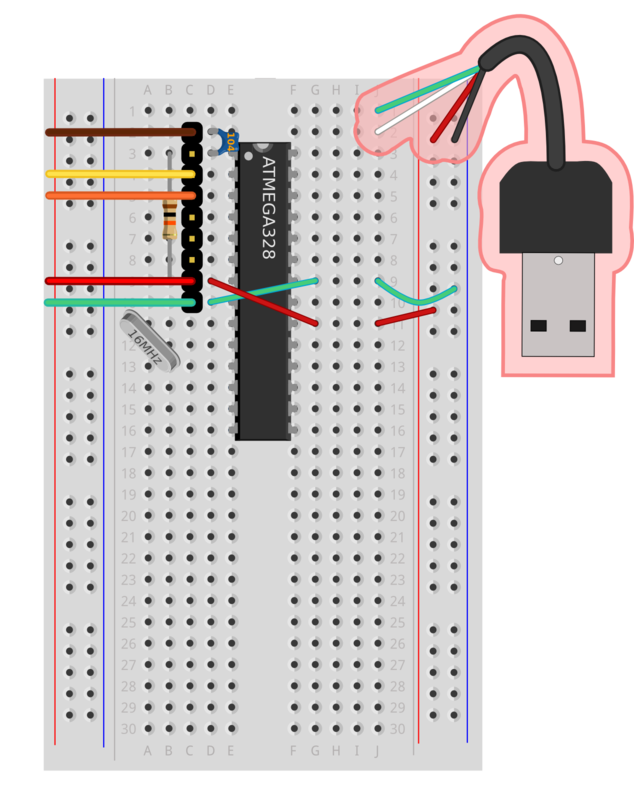 Now the USB circuit is complete, it should be able to connect to a computer as a USB device. So we'll upload a behaviour which makes it pretend to be a USB keyboard, and type some text automatically. To test this, navigate to File=>Sketchbook=>shrimpingit=>Keyboard=>Keyboard00HelloWorld to load some new code (this assumes you've already configured your software when testing Blink). After the code opens in the Arduino IDE, choose File=>Upload to upload the code. It should report 'Done Uploading' and no red error text should be visible in the bottom panel. Now open a new Sketch in the Arduino IDE and place your cursor inside. We're just going to use this as a scratchpad to see the typing which our hacked keyboard will generate. Once you plug in the hacked USB cable, it should appear as a keyboard and begin typing the text 'hello world'. You could already use this circuit for a practical joke like this (use a long timer before typing) or to log into your computer automatically by typing your username and password. We're not going to stop here, though. Next we're going to attach a series of pull-up resistors which are so strong that a human body is relatively much more conductive. When we're not touching a pad on the conductive keyboard, the only connection to the ATMEGA's top-right pin will be a 20 MegaOhm resistor pulling it to nearly +5V. This +5V signal is an indication to the ATMEGA that we're not touching the pad. When we touch a pad on the conductive keyboard, our bodies provide the connection to 0V (Ground). Because our body's has a lower-resistance connection to ground than the 20MegaOhm connection to 5V, our body can pull down the ATMEGA's sensing pin to nearly 0V. This 0V connection made through our body is an indication to the ATMEGA that we are touching the pad. The 20 MegaOhm resistors have Red Black, Blue for a code sequence 2, 0, 6. The first two figures are 2 and 0, and this should be followed by six extra zeroes, in other words 20(000000) Ohms. There are 1000000 Ohms in a MegaOhm so that's the same as 20 MegaOhms. Now we are ready to add some wires to make a conductive keyboard. We can have multiple different wires which can be monitored independently. In this way, you can create a Banana Piano with up to 16 keys! Let's start by wiring the extra pull-ups on the right hand side. There are just eleven inputs available on the right hand side of the ATmega, so we'll use the left-hand side to give us another five. We activate the left-hand +ive power rails by attaching a +5V connection for the left-hand pullup resistors we will need. As good practice, we're also wiring the ground rail at the same time, even though we're not using it yet. Now the power rail is active, we can add the extra five 20MegaOhm pull-up resistors.